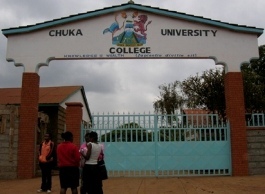 Chuka University College is a public institution established through a legal notice No. 161 of 2007. It is a constituent College of Egerton University and the successor of the former Egerton University Eastern Campus College, Chuka. The Campus College was established on 27th September 2004, by Egerton University Council to enhance access to high quality and affordable University education to the people living in the Eastern region and Kenya at large. This endeavor was fast-tracked by the donation of 550 acres of land and other facilities essential for current and future expansion of the institution by the local community. This included all the land and facilities formerly owned by Chuka Polytechnicwhich was founded in 1956. His Excellency President Mwai Kibaki appointed the first Council of the University College on 12th September 2008. A prominent businessman and renowned leader, Eng. Wilfred Murungi was appointed the first Chairman of Chuka University College Council. The college is headed by the principal who is also the CEO and two deputy principals- Finance, Planning & Administration and Academic affairs. Faculty of Education and Resource Development, Faculty of Business Management, Faculty of Science and Engineering Technology, Faculty of Arts and Humanities and Faculty of Agriculture and Environmental Studies. To work with other stakeholders to provide, promote and coordinate life-long education, training and research for sustainable development and responsible citizenry. Consequently, we will be able to generate, preserve and disseminate knowledge and offer exemplary education to contribute to and innovatively influence national and global development.